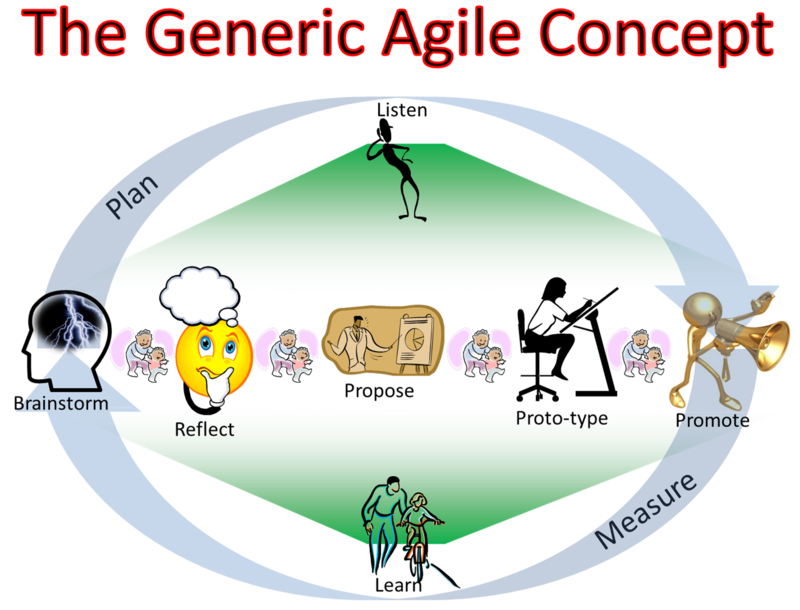 I created this simple graphic to demonstrate what the generic concept behind agile is. What are your favorite agile diagrams? This entry was posted in Uncategorized and tagged Agile, Agile Adoption, Agile Methods, Business Agility, scrum, Software Development. Bookmark the permalink. I just got a copy of your chart and I when to you site to see if there was any explanation for it. do you have any detailed explanation for this and where code maintenance fits in? J.D. in a IT setting the code maintenance is continuous and begins day 1 code is written and is totally influenced by every pass through the cycle. It only stops when the code is retired. The fist objective of code maintenance to to make sure the code supports all the latest variations of the user story. The second is to improve the efficiency of the code when it makes business sense. Neat graphic! I am printing this one out and hanging it up. Don’t have a graphic of my own. This is cool and colorful though. I like this graphic! It says it all in a simple way.